It began with an apple. Years ago, when our oldest son, Tyler, was nine years old, we invited one of his neighborhood friends to join us on our annual apple orchard outing. Will is two years younger than Ty, and it just breaks my heart when I see this tall, muscular GUY next door shooting baskets. He's the youngest of Ty's neighborhood gang and always fought to keep up with the older boys. Soon he, too, will be off to college. Sorry. A sentimental Mom-moment distracted me. Anyway, we were out among the trees, and Peter picked a few apples. He handed one to each boy, then took a bite of his. “You can't do that,” he said, horrified. “Don't worry, honey, we'll pay for everything when we get back.” What an honest boy, I thought. Will looked at me like I was from another planet. It's fall, and I'm thinking about apples. And remembering Will's innocence. With the arrival of fall, I know I'm not alone in my apple preoccupation. My Facebook page is filled with pictures of friends' families hunting Granny Smiths, Golden Delicious, Jonagolds. 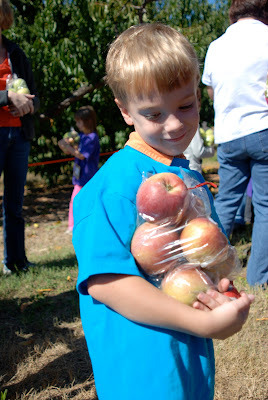 This year, we branched out and tried a different orchard, one in North Carolina. Normally, we visit a local orchard that's ten minues from our house—but truthfully, we've always gone for the experience rather than the apples. The apples at our local orchard are tasteless, even a little mealy. This year, I wanted a good variety of flavorful apples, even if it meant forsaking our (very) local orchard. is exactly that—a lush, rolling, mountain-top orchard with stunning views. Located in Flat Rock, North Carolina, we visited early in the season, but the parking area was packed. With 40 acres to roam, though, the only places we really bumped into other visitors (besides the parking lot) was in the apple cider donut line. Can you believe that I never tasted an apple cider donut before this fall? It's was pure sugar and grease and deliciousness. Heaven. I'm not an apple expert. I've gone apple picking every year for probably the past 18 years...and I still don't remember which varieties are tart (besides Granny Smith), which are good for cooking, which are best fresh. During our apple hunting, I was certain Peter searched for a variety of apple that didn't exist (“Jonathan” versus “Jonagold”—the one I was familiar with). I started to tell him in my know-it-all wife voice that his search was futile...until we found his variety already pre-picked. I just hate when he's right. After a lovely family outing, I decided it was time to increase my knowledge of apple varieties. I started doing some research and found a great article on Saveur. It's my go-to guide now. Do we honestly think I stopped there? I'm now completely smitten with heirloom apples. Slow Food USA's Ark of Taste. “The Ark is an international catalog of foods that are threatened by industrial standardization, the regulations of large-scale distribution and environmental damage. In an effort to cultivate consumer demand—key to agricultural conservation—only the best tasting endangered foods make it onto the Ark. The apple is an American icon. 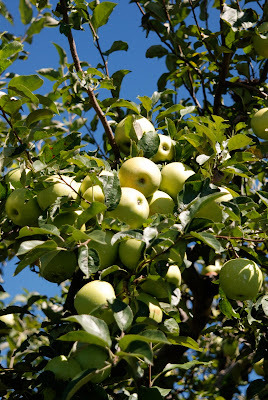 However, of the approximate 14,000 varieties that evolved from the seeds brought into North America by English settlers, today only 11 varieties comprise 90 percent of all apples consumed in the U.S. Those 11 varieties that dominate the produce aisles are grown in large commercial orchards, easily packed and shipped to far away locales. The perfect, glossy globes attract consumers—but flavor is sacrificed for shipablility and presentation. One of the goals of Slow Food is to make consumers aware of varieties that are dying out due to mass production. It's Economics 101. By experiencing the unique, richer flavor of heirloom varieties, consumers will begin requesting heirlooms, and farmers will find a market to continue producing tasty, regional fruits. Sounds simplistic, doesn't it? Of course, it's a much larger challenge. So, in my own small effort to support heirloom varieties, I'm researching nurseries and varieties and figuring out how to tell Peter that we need a small orchard near the river. Until then, I'm taking an inventory of the apples waiting in the refrigerator. Not only did we bring home dozens of apples from our family's Sky Top outing, Michael and I also brought home apples from his kindergarten field trip. It was a little sad. The kids picked apples—out of bins. So now, there's a generation of kids who think apples come from bins on farms. Hmm. Somehow, I don't think that was the point of the field trip. Still, we are—literally—bursting with apples. , for an excellent “Apple Tart Cake.” The author of the blog, Molly Wizenberg, stated that the tart is even better the second day. She's right. If you've never visited Orangette, please do. You'll be delighted. You can use any variety of good, tart apples. What are your favorite varieties for cooking or fresh eating? I'd love to know. So, head to the kitchen, pull out those apples from your orchard visit, and start peeling. You'll be so glad you did. Preheat oven to 350°. Butter and flour a 9-inch springform pan. Combine the sugar, flour, and baking powder in a bowl. (I used my KitchenAid mixer, which worked fine, but the original recipe calls for use of a food processor.) Add the butter. Mix until no large lumps remain. Add the vanilla and the egg. Blend well. Mixture will be crumbly. Dump mixture into the prepared springform pan, using your fingers to gently press it along the bottom of the pan. If the dough sticks to your fingers, like it did with mine, just put a tad of flour on your fingertips. Make a slight, gentle, upward curve at the edges to form a low rim. Arrange the apple slices over the base in a tight circular pattern. Really overlap them. I didn't overlap the apples the first time I made it for fear they wouldn't cook well. My mistake. Place the pan on the middle rack in the oven, and bake for 45 minutes. While the cake/tart is baking, prepare the topping. Combine the ingredients in a small bowl, and whisk to blend well. After the cake has baked for 45 minutes, remove it from the oven, and pour the topping evenly over it. Bake for another 25 minutes or so, until the topping looks set. Transfer the pan to a wire rack, and cool for 20 minutes. Then run a thin knife around the edge to release any areas that may have stuck, and remove the sides of the pan. Cool completely before serving.